Love em or hate em, the crocodile is (in my eyes) one of the most fascinating and beautiful creatures on this planet. Obviously deadly, but perfectly at ease with itself never needing to adapt or evolve it continues to rule the animal kingdom and rid its waters of the odd human. It lies await with zen-like calm almost in a faux meditative state until something catches its menacing eye and then uses its muscular tail to fling itself towards its victim. I’m in absolute awe. Heading back to Australia wasn’t on the original agenda but a cheeky Aussie and the lure of spotting crocodiles tempted me back. Stepping off the plane in Darwin was overwhelming, the heat and humidity smacked me right in the face and sucked the life out of me. Once I’d scraped myself off the floor and into one of Mitchell Street’s bars things got livelier. Darwin’s not a bad night out, with live music, some top food places and a massive imbalance of men to women. A tiny bit gutted we never made it to ‘Throb’ though… what a name for a club! We hired a car to make our way round the Northern Territory and set off to do a loop through Kakadu and Litchfield National Parks, passing through and staying over in a series of small towns en route. Katherine was the largest town, but we also hung out in Batchelor, Jabiru, and Mary River to name a few. The Aboriginal population in the NT is far higher than I’d experienced in the rest of my Aussie travels. The indigenous people often cluster in groups, choosing to sit on the ground rather than benches. They appear to live life with one foot in their traditional ways and one foot in the western world. Yes there have been steps to encourage integration but through my outsiders eyes it doesn’t seem to have been hugely successful. Amongst the Aboriginal community alcohol is a huge issue and we witnessed a few rowdy drunken arguments. They receive royalty cheques each week for the use of their land but seeing the confused lifestyle they now lead I couldn’t help but wish they’d been left to their traditional ways. There are some areas that have remained solely Aboriginal, Arnhem Land being one of them – outsiders need to obtain permits to enter. There are also cultural centres all over and with an obvious Aboriginal input, designed to help teach about their lifestyle and belief system. I love their outlook on life as it’s all about the land and harnessing nature, their artwork is all about storytelling and ‘Dreamtime’ is something all cultures should embrace. Sadly though now many are in limbo and probably carrying a ridiculous amount of hurt with them from the mass genocides and other atrocities that they had to endure. Anyway, back to spotting crocs. We tracked these beasts down in their natural environment on the Mary River. Winding our way through the wetlands in a small boat we saw a few beauties tucked away under shrubs and some yellow lizard like eyes poking out of the water. Don’t get me wrong, I loved this but it just made me want more croc action. I wanted to see these beauties attack! 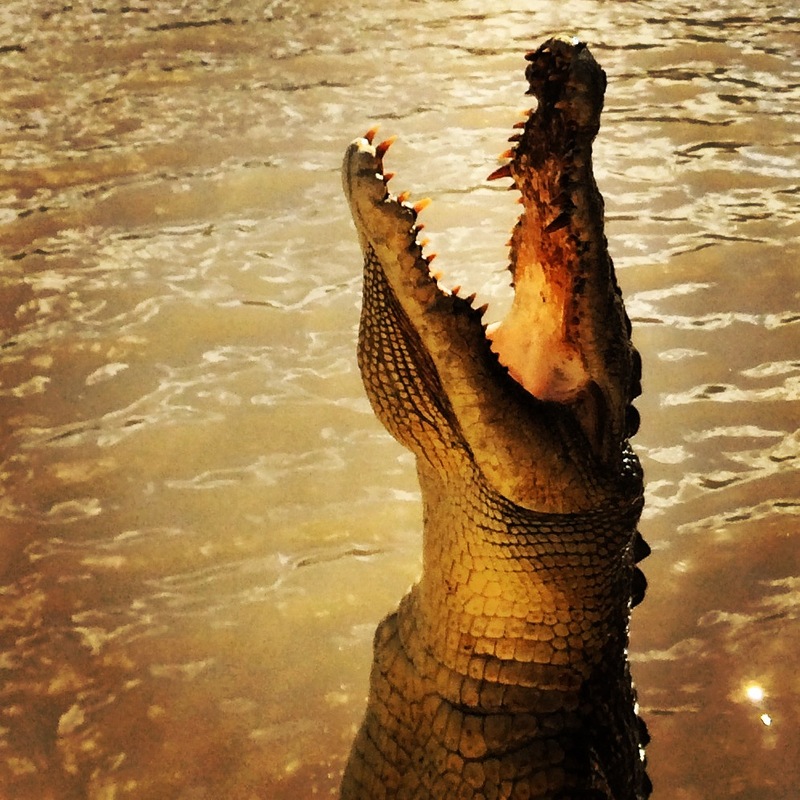 The place to see crocodiles in their droves is Adelaide River, so we headed there. Small boat trips are run here to watch them in action. I’m still trying to work out whether this is actually okay and I’m thinking it probably isn’t, but the experience was so unbelievably amazing… I’ll tell you what occurred. We headed out onto the river into the croc’s domain, but the crazy ladies running the show used rods with pig’s heads and pork chops and dragged them through the water to lure the crocodiles in. Once they were close the bait was dangled above the water so we could see their majestic jumping. 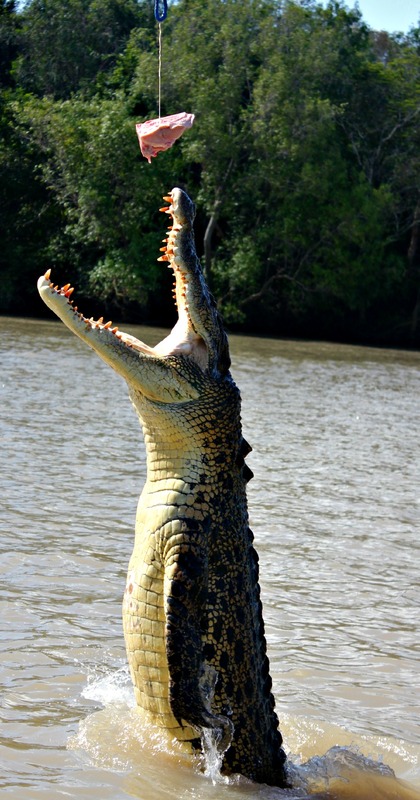 Apparently this mirrors the crocs natural behaviour, as they use their muscly tails to propel themselves out of the water to catch prey. The crocs are always allowed to eat the bait and there are thousands of crocs on this stretch of water, with their numbers ever increasing. I love crocodiles and wholeheartedly hope this trip does not cause them distress or impact the ecosystem. It was a spectacular sight and I feel honoured that I was able to witness their majestic jumping in their natural environment.